Rebecca Bloomwood is a 25 year old writer who lives in New York City with her best friend and dreams of writing for Alette magazine. Rebecca has an endless shopping addiction. She will find any excuse to buy something and because of her shopping habits, she has a stack of unpaid debit that is quickly growing along with debit collectors trying to pin her down. By chance Rebecca lands herself a job writing for a financial magazine and catching the acclaim of thousands including her new boss Luke, by writing innovative comparisons and unconventional metaphors for economics about the very consumer caution that she herself is not following. When Rebecca's debit finally catches up with her, she is tested by her true ambitions and her condition of being a shopaholic. "Confessions of a Shopaholic" is a very typical whimiscal comedy with the cliche storyline of girl meets guy, girl loses guy, girl fights to guy back. 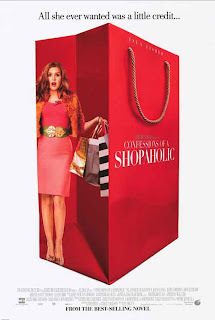 What saves "Confessions of a Shopaholic" is Isla Fisher's charming comedic performance and the great monologues that were taken from the book series written by Sophie Kinsella. Kinsella's novels perfectly grabbed the tone and feeling of people who suffer from impulse buying or being known as shopaholics and the film does a great job of playing up those impulses into very funny segments. Director P.J. Hogan (Muriel's Wedding), does an able job of translating Kinsella's novel on to screen with both humorous situations and some minor heart that delivers a suttle message. Isla Fisher delivers a quality and lighthearted performance as Rebecca Bloomwood in "Confessions of a Shopaholic." She carries the weight of the film with her adorable charm, bubbly narration and humorous antics, proving that she can handle a leading role. Fisher's performance is grounded in well written dialogue that was adpated from Sophie Kinsella's book by screenwriters Tracey Jackson and Tin Firth. One of her best deliveries (that absolutely nailed the actual addiction) comes at group when Rebecca explains the rush and sensation you get when you shop. Even I was like, I feel like buying something. John Goodman and Joan Cusack are entertaining as the financially reserved parents of Rebecca and Hugh Dancy was very capable as the heart throb to Rebecca, Luke Brandon. While the supporting cast, all play their parts well, it is Isla Fisher's performance that gives the film it's life, charm and enjoyability. Outside of the performances in "Confessions of a Shopaholic," the story is ultimately too generic to be given any notable accalades. From the beginning of the film through the end, "Confessions of a Shopaholic" is drastically predictable leaving the final result as merely a, I told you so finish. Honestly, I can't say I expected anything different. The film was however, still an enjoyable watch with quite a few great laughs mixed in. Most notably the scenes where Rebecca attends group therapy for her addiction. The group dynamic was done very well, especially considering it isn't the first or the last time a comedy has tried to use therapy in a comedic setting. "Confessions of a Shopaholic" was a fun film to sit back and enjoy. The comedy is well written, the performances are memorable and despite a typical storyline it entertained all the way through. Isla Fisher proves she deserves more leading roles and creates a hilarious character that is sure to get some followers similiar to Elle from Legally Blonde films. The film trys to tackle the addiction people can face from consumerism however, it is unfortunately overshadowed by the all to common love story webbed throughout the 104 minute film. Overall "Confessions of a Shopaholic" is something I'd definately watch again, just not so sure I purchase it for my own collection (well, maybe on sale).